Sheila's Cottage stands near the eastern coast of the island of Ulva and looks across the Sound of Ulva to the Isle of Mull. 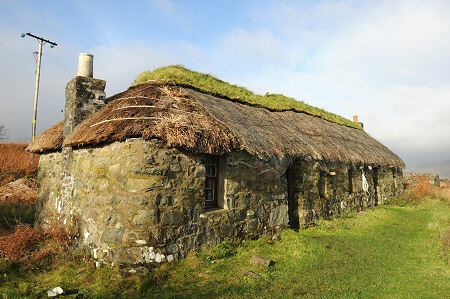 It is a remarkably well restored traditional thatched cottage and serves as Ulva's museum and heritage centre. The cottage stands only about 100 yards north of Ulva's main slipway, where you will almost certainly have arrived on Ulva, usually on the small ferry connecting the island with neighbouring Mull. To reach the cottage you simply stroll past the Boathouse tearoom (or perhaps go via it) along the start of the track that leads to Ulva Church. Sheila's Cottage stands next to the track at its first corner. Sheila's Cottage is named after Sheila MacFadyen, who lived here from about 1900. She worked as a diary maid at Ulva House, and earned a small additional income collecting winkles. The cottage comprises two main rooms. The family would have lived on one, while their livestock would have been kept in the other. 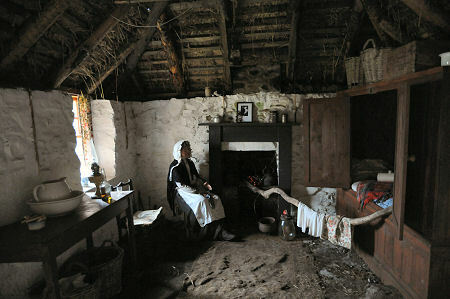 The recreation of the living area of the cottage shows Sheila sitting by a hearth which she used to feed by pushing a whole tree branch slowly into the fire as it was consumed. The other end of the branch served as an airer for drying her washing. Sheila MacFadyen became too frail to manage life in the cottage and moved to end her days on Mull in the 1950s and her cottage became a ruin. In the 1990s, the Howard family, who own Ulva, undertook the restoration of Sheila's Cottage to house a heritage centre for the island. 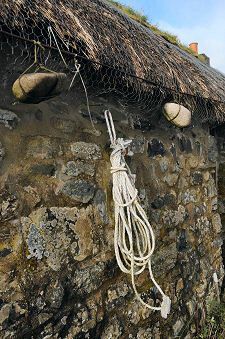 The work was undertaken by skilled craftspeople from Mull, Skye and even Ireland, and the work was complete in 1998. The south end of the cottage is home to a recreation of Sheila's living accommodation, including a box bed and a dresser. The larger north end of the cottage is the heritage centre. Here you find a series of displays charting aspects of Ulva's story, and some very useful information about places to go and things to see on the island. It is no exaggeration to describe Sheila's Cottage as an essential first port of call (or, perhaps, second, after the Boathouse tearoom) for anyone visiting Ulva.